Live Action Role Playing (heretofore referred to as LARPing or larping) is fundamentally critical to the success of the future. It is the bridge between every race and class in this world. Anyone, anywhere in the world has everything they need to do it at a moment’s notice. It does not care in the least how young or old, healthy or sick you are, and in many cases, it does not even matter what language you speak. All you need to know is how to play. As long as you participate within the framework of any given larping scenario, you are an active part of the game, building the experience for the other players around you. It doesn’t mean you will be great at it, it doesn’t mean you will be the brave hero in every story, and for thousands of players all over the world, you may never fight a single monster or finish a single quest. You will have simply taken another step on your journey, experiencing something deep and rich along the way. The ability to transcend time and space, remove and rebuild social constructs as you see fit, these are not tools to be taken lightly and they come with some responsibilities for those of us who feel called to organize and support this community. It takes a lot of work and a lot of effort to keep a LARP community engaged, but the rewards are rich and lasting. A community that grows and plays together can experience wonders that literally cannot be found anywhere on the planet. By combining the imaginations of human beings, each infinite in its own way, the endless possibilities for exploring together can become the basis for friendships that last a lifetime, through thick and thin. My name is Clinton Graybill and I’ve been larping for over a decade. I direct a live-action role playing theater company called Epic Adventurez and we’ve been directing events for adults and children all over the greater Philadelphia area for the last five years. Our core belief is that through play we can dissolve the barriers that plague or society and allow ourselves to become more than we think we can be. I’d like to explore the power of LARPing, its unique properties that make it perfectly suited helping both the introverted to look outside of themselves and the extrovert to learn to care about their own needs instead of being so interested in others. Larping gets the nerdy bookworm outside running around and the sporty jock dressing up and pouring his heart out. It is the bridge we want, it is the game we need, I believe LARPing is critical to the success of the future. LARP gambling can be very common in the fantasy/combat world. 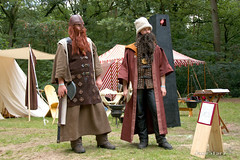 Whether to dress up as a dwarf, a werewolf, or an elf: cosplay is a part of the whole Live Action Role Playing Experience. Not only do players need the necessary weapons, but they must dress the part. LARP activants escape into a world where fantasy becomes real. In this article, we explore the process of creating costumes through a man named Louis Debruyne. Louis Debruyne is a French Larper, but prefers to be called “Gimlee” as a reference to Gimli in The Lord of the Rings and “Bruce Lee” as a great man. 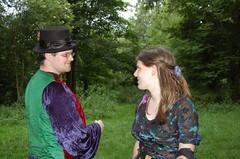 He is in a LARP association, Le consortium de Griffe. He was Kandorya, the biggest French LARP, playing a dwarf when he ran into a little problem. He was too tall to play a dwarf! Because of this he devised a plan to make him appear smaller. After much thought and blueprints, he came up with the idea of barrel-boots. The structure itself is in PVC, easy to buy in a building material store, and the exterior is made of groundsheets. It’s cheap and easy to mold. When the barrels were done, he had to paint them with some waterproof paint to protect the interior and limit the damage to the structure. Then, he painted with colors. He wanted a render cartoon, like World of Warcraft. It was a two-month project, but the product is something he is proud of. He plans to make repairs and upgrade it! Read the full article to find out more about his creative process and gain advice on making your own LARP costume and weapons. 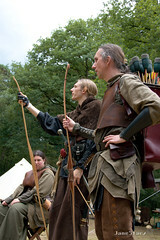 Boffer arrows and packet arrows are two different weapons that archers can choose from in battle. Every Live Action Role Playing game is different, and each game has different rules when it comes to combat. For archers, the rules are even more diverse. Some games allow foam-tipped boffer arrows that are similar to actual arrows, which are fired from actual bows. Other LARPs require boffer bows covered in foam that do not fire, but that ranged combatants throw packets full of bird seed by hand. While each player may have a strong preference over the other, each method has their advantages and disadvantages. The Boffer arrow is more realistic looking. It can shoot your arrow multiple feet away. In the same instance, this is what makes it more dangerous. The packet arrows on the other hand are more game friendly. You have to throw the packets, which takes away from the realism. One Live Action Role Playing adventurer respects both methods, but her current LARP group requires members to use packet arrows due to the regulations in the state park they use for their game. She asks what fellow archers prefer and the benefits they see in the boffer arrow and the packet arrows.